This article was written by Will, a member of our team at the Dayton headquarters. Will is involved in a number of Reynolds' programs and wanted to give readers the inside scoop on what life is like outside of work hours. 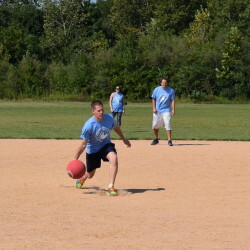 Though most of us haven’t played kickball since middle school, it’s one of those childhood games where fun is virtually guaranteed. Add in a couple of great friends and the chance to win money for the charity of your choice and it’s almost impossible to have a bad time. Luckily for me, Reynolds hosts an event matching that description every year. I was new to the Dayton area and thought it was a great opportunity to meet friends. Competitively played, nostalgia-inducing team games are the best kind of games. I’m not one to pass up an opportunity to help a good cause and have fun at the same time. Accepting her invitation proved to be an excellent decision. I got to meet associates from departments I wouldn’t normally interact with, strengthen relationships with the friends on my own team, and to cap it all off, we won the tournament and donated more than $500 to our charity, Paw Patrol Dayton. As a reigning champ, I was eager to defend the title. I anxiously awaited the next tournament announcement. Thanks to all the friends I had met in sports leagues throughout the year, I had no problem getting a team together and even took over as the captain. I recruited players, coordinated donations, distributed information, and managed the roster on game day. After a team vote, we decide we would be playing for the Prostate Cancer Foundation. When tournament day arrived, we played hard for all four of our games, earning victory in three of them. Our wins were enough to get us back to the championship to defend our title. We took an early 2-1 lead which we held until late in the game. Our opponents scored two runs in the bottom half of the final inning, putting a stop to our back-to-back title bid and sending the more than $500 in winnings to the Artemis Center. It was a great tournament and I’m already looking forward to the next one! It's nice to work for a company that encourages its employees to get together outside of work. My time here at Reynolds has been marked by incredible people, endless opportunities, and, of course, kickball.